Juvenile breast cancer is rare and poorly known. 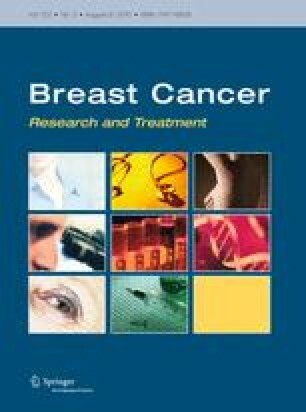 We studied a series of five breast cancer patients diagnosed within 25 years of age that included two adolescents, 12- and 15-years-old, and 3 young women, 21-, 21-, and 25-years-old, respectively. All cases were scanned for germline mutations along the entire BRCA1/2 coding sequences and TP53 exons 4–10, using protein truncation test, denaturing high performance liquid chromatography and direct sequencing. Paraffin-embedded primary tumors (available for 4/5 cases), and a distant metastasis (from the 15-years-old) were characterized for histological and molecular tumor subtype, human papilloma virus (HPV) types 16/18 E6 sequences and tumor-associated mutations in TP53 exons 5–8. A BRCA2 germline mutation (p.Ile2490Thr), previously reported in breast cancer and, as compound heterozygote, in Fanconi anemia, was identified in the 21-year-old patient diagnosed after pregnancy, negative for cancer family history. The tumor was not available for study. Only germline polymorphisms in BRCA1/2 and/or TP53 were detected in the other cases. The tumors of the 15- and 12-years-old were, respectively, classified as glycogen-rich carcinoma with triple negative subtype and as secretory carcinoma with basal subtype. The tumors of the 25-year-old and of the other 21-year-old were, respectively, diagnosed as infiltrating ductal carcinoma with luminal A subtype and as lobular carcinoma with luminal B subtype. No somatic TP53 mutations were found, but tumor-associated HPV 16 E6 sequences were retrieved from the 12- and 25-year-old, while both HPV 16 and HPV 18 E6 sequences were found in the tumor of the 15-year-old and in its associated metastasis. Blood from the 15- and 25-year-old, diagnosed with high-stage disease, resulted positive for HPV 16 E6. All the HPV-positive cases were homozygous for arginine at TP53 codon 72, a genotype associated with HPV-related cancer risk, and the tumors showed p16(INK4A) immunostaining, a marker of HPV-associated cancers. Notably menarche at 11 years was reported for the two adolescents, while the 25-year-old was diagnosed after pregnancy and breast-feeding. Our data suggest that high-risk HPV infection is involved in a subset of histopathologically heterogeneous juvenile breast carcinomas associated with menarche or pregnancy and breast-feeding. Furthermore we implicate BRCA2 in a juvenile breast carcinoma diagnosed at 21 years of age, 4 years after an early full-term pregnancy, in absence of cancer family history. The online version of this article (doi: 10.1007/s10549-009-0596-6) contains supplementary material, which is available to authorized users. Gitana Maria Aceto, Angela Rosaria Solano equally contributed to the work. GMA, ARS, RMC, and EJP contributed to study conception and design, and acquisition, analysis, and interpretation of data; and drafted and revised the manuscript critically for important intellectual content. MIN contributed to sample preparation and genetic analyses, and participated in data analysis. SV carried out genetic analyses, data analyses, coordinated data collection and drafted the manuscript. AMo contributed to the somatic genetic analysis and data collection. SM performed the pathological examination of the samples. RDCh critically reviewed the manuscript and participated clinically in the diagnosis and follow up of patients and sample provision. CP participated clinically in the diagnosis and follow up of patients and sample provision. ML participated clinically in the diagnosis and follow up of patients and sample provision. PB contributed to genetic data analyses and manuscript preparation. AMa designed and supervised pathological analyses data and contributed to drafting the manuscript. All authors read and approved the final manuscript.